It's Fat Tuesday, and there's plenty of ways to celebrate without traveling to the Big Easy. 920 14th Street NW, Washington, D.C.
5 p.m to 2 a.m.
For Mardi Gras, The Park at 14th is transforming into The Park at Bourbon Street. Enjoy dinner and then turn on the party with beads, masks and live music. RSVP at their Eventbrite page. 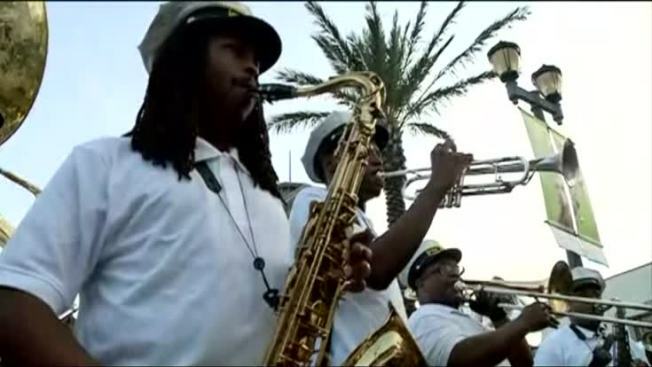 Listen to the sounds of classic NOLA brass band music with a "Wharf-wide extravaganza" featuring a parade along the waterfront, a dance party on District Pier and a fireworks finale. Check their website for a full schedule. 1309 5th Street NE, Washington, D.C.
Union Market’s Mardi Gras Extravaganza DC will benefit DC Central Kitchen. There will be special appearances by Louisiana natives, like D.C. Chef David Guas and Louisiana Lt. Gov. Billy Nungesser. There will be free Mardi Gras beads, devilish red masks and souvenir cups. Lyft is providing a 20 percent discount for those leaving the event. Wilson Blvd and North Barton Street, Arlington, Va. The 2018 edition of the Clarendon-Courthouse Mardi Gras Parade (weather-permitting) will start on Fat Tuesday, February 13, at 7:00 p.m. at Wilson Blvd and North Barton Street, and will continue up Wilson Boulevard, past Liberty Tavern and end on North Irving Street. Register for the parade or buy Mardi Gras beads here.